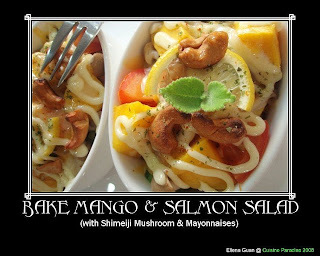 Salmon Baked Rice for Saturday Lunch and now we have Bake Mango & Salmon Salad using the remaining Salmon cutlet that I have left over from making the Salmon Bake Rice. Hahaha! This is one of the bad-point when preparing meal if there are less people at home as we tends to have some extra ingredient left over from making the previous dish. 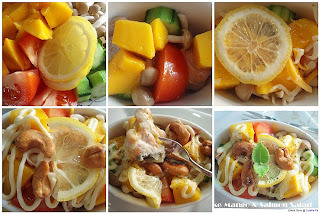 This is a very refreshing and colouring dish there consists more than 5 colours: 1) Pink for salmon, 2) Yellow for mango and lemon, 3) Brown for Shimeiji mushroom and cashew nuts, 4) Green for cucumber and seaweed flakes, 5) Red for tomato 6) White for mayonnaise sauce and cheese. This dish is very easy to prepare all you need is about 15 - 20 minutes of cutting and baking time. 1. Pre-heat a small saucepan with 1/2 teaspoon of olive and and stir-fry the Shimeiji for 30 seconds and remove, set aside. 2. Next lightly pan-fry the salmon cube for about 30 seconds on each side until it's almost cooked through, remove and set aside. 4. On the top layer, drizzle some Japanese mayonnaise, shredded cheese and cashew nuts then pop it into the toaster oven for about 5 minutes until cheese melt. 5. Serve it as a starter or side dish and you can sprinkler some seaweeds flakes on it. a) You can purchase those small packed of snack roasted cashew nuts from supermarkets. b) Rinse and cut the Shimeiji mushroom into single stalk. c) You can omit using cheese if you don't not have them or you are not a fan of cheese. 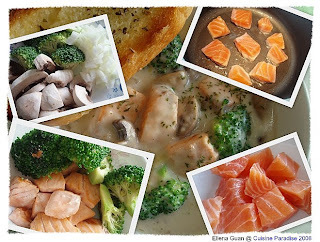 As you might notice that I always cooked with either salmon or cod fish that is because the flesh on these fish are much fine and tastier for my picky boy :) And he loves to eat either one of this fish whenever I come out with new ideas to cook them. Today's Special will be on Salmon again and we are going to make a simple version of Salmon Baked Rice without using any white or red sauce. Yup... no hectic preparation of sauce involved. 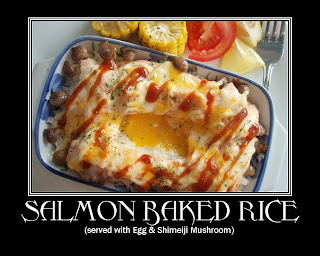 It's just some cooked rice, fresh salmon slices, shimeiji mushroom, egg and Japanese Mayonnaise sauce. That's it! With all these ingredients you can whipped up a Quick and Easy Salmon Baked Rice within 15 - 20 minutes. 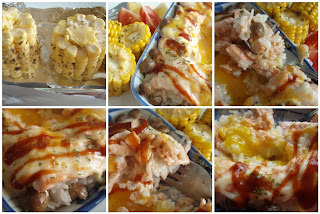 From the pictures, you can see that i actually serves it with some extra baked butter corns, tomato wedges and drizzle some extra BBQ sauce on top of the baked rice to enhance the favour. Since there are no liquid sauce in this baked rice, I crack an egg in the middle of the rice to create some moisture from the egg white and yolk. 1. Cook the rice accordingly and get ready a 1 person serving size baking dish. 2. Drizzle about 1 teaspoon of olive oil in a small non-stick pan and stir-fry the shimeiji mushroom for about 30 seconds, remove and set aside. 3. Next spoon the cooked rice into the baking dish and arrange the shimeiji mushroom around the side of the baking dish. 4. Make a well in the middle and crack an egg into the hole. 5. Lastly arrange the salmon slices on top of the rice and spread the shredded cheese evenly on top the fish. 7. Remove the bake rice from the toaster and drizzle some extra BBQ sauce on top and serve immediately. a) Rinse and cut the shimeiji mushroom into individual stalk from the bundle. b) You can serve it with some baked corn, just removed the husk from the corn, wash and pad dry then brush it with some butter and baked in the toaster oven for about 10 minutes, turn occasionally. This is our Sunday afternoon Tea-Break which I specially made for Reyon using the Mini Pooh Silicon Mould that one of our friend bought for us from Japan. 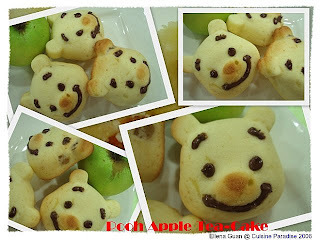 Since I have a few apples sitting in the fridge for some time, I decided to use ti to make this sweet and soft Pooh Apple Tea-Cake. 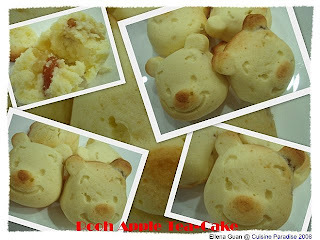 This Apple Tea-Cake is rather easy to make and it is sort of using the similar concept as the Mango Jam Cake where you put the filling in between the cake batter and bake. But before you start off with the cake batter you have to prepare the Candied Apple first. For my candied apple, I add in extra golden raisin and RUM to enhance the favour. 1. Wash, peel and cored the apple, then cut into small cubes and place all the ingredients into a small heavy-based saucepan and cooked over medium low heat for about 15 - 20 minutes. 2. Stir occasionally and cooked till the apples cubes are almost transparent (like picture 3 on row 2 shown above) . 3. Remove from the pan and set aside to cool. 1. Sift the flour and baking powder together and set aside. 3. Slowly fold in half of the flour mixture and give it a few stir till combined, then grate in 1 apple and lemon juice. 4. Give the mixture a few stir and then add in the second half of the flour and grate in the remaining apple and stir the mixture till well combine. 5. 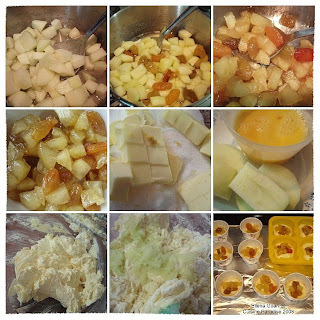 Next pipe or scold 1/4 of the batter into the muffin cup or mould then top with 1/2 Tablespoon of the candied apple and fill the batter to about 3/4 cup fill. 6. Bake in the preheat 180 degree oven for about 15 - 18 minutes, test it with a skewer around 15 minutes. Cooking western style of soup is never to be on my soup making list because I always have a concept that it will be a hard time to prepare western soup due to their list ingredients and cooking process. 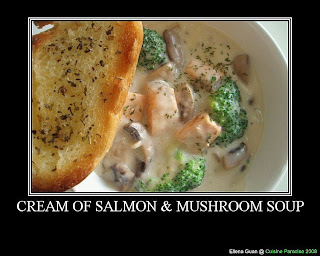 But today, I finally have the courage to try out this simple and easy Cream of Salmon & Mushroom Soup which require the most simplest list of ingredients in most pantry and fridge. This soup come in just warm and nice for this rainy Sunday afternoon. It's so simple to prepare and yet it's full of nutrition with the combination of seafood and vegetables. This is also a healthy version without using Cream to thicken the soup base. In order to make this lunch more fulfilling, I served it with a few slices of butter toast. 1. Removed the skin from the salmon fillet, and cut it into equal cubes sizes around 1.5". 2. Rinse and peel off the skin from the button mushroom, halves it and diced the onion. 3. Blanch the broccoli florets in light salted water for about 30 seconds, removed and rinse with cold water. 4. Pre-heat a pan with about 1/2 tablespoon of olive oil, and pan-fry the salmon cubes for a about 1 minute on each side until cook through, season with pinch of salt during the process. Remove and set side. 5. Next add in another 1/2 tablespoons of olive oil, saute the diced onion until almost soft then add in the mushroom and stir-fry for a about 20 seconds and remove. 7. When the salt is done, season it with some salt or stock cubes(if you prefer a stronger taste), then add in the broccoli, onion and mushrooms then give it a quick stir then return it to the heat for a few seconds. 8. Quickly at in the salmon and stir gently so as not to break up the cubes. 9. Remove from heat and served it with either butter or garlic toasts. a) If you don't like salmon, you can replace it with cubes chicken thigh/fillet. Snow Jelly is an extract taken from the female of a frog species, which live in the forest of Jiang Baishan mountainous region in Northeast China. Known originally as "Hashima" a Korean name, it is now widely known in English as Snow Jelly. The product has been tested and found to contain high levels of protein (amino acids), minerals such as iron, phosphorus, magnesium and potassium as well as vitamins B1 and B2. Best of all, its cholesterol-free! The benefits of consuming Snow Jelly is to strengthen the internal organs especially the lungs and also for a healthier skin complexion. The benefits derived are similar to consuming bird's nest except that Snow Jelly is available at a fraction of the cost. 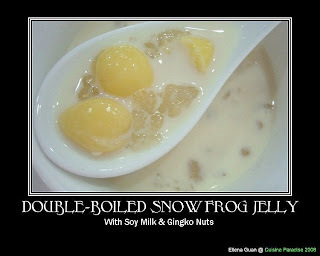 So for our Today's Special on Dessert, we will be having Double-boiled Snow Frog Jelly with soy milk and gingko nuts. Soy milk (also called soya milk, soybean milk, or soy juice) and sometimes referred to as soy drink/beverage is a beverage made from soy beans. Soy milk contains about the same proportion of protein as cow's milk. It has little saturated fat and no cholesterol, which is a benefit. 1. Rinse and soak the snow frog jelly according to the package instruction and remove any dirt accordingly. Drain and set aside. 2. Rinse and marinate the ginkgo nuts with about 2 teaspoons of sugar for about 15 minutes. 3. Bring the soy milk to boil then add in the ginkgo nuts and let it return to boil again. 4. Transfer the soy milk mixture into a double-boiled and double-boiled for about 30 minutes then add in the snow frog jelly(the soak and expand jelly) and rock sugar and continue to stew for another 20 - 30 minutes. 5. You can serve it either cold or warm. a) Usually I bought the Snow frog jelly from "Hockhua Tonic(福华) " which they called it the Crystal Haishma (水晶雪蛤). b) I used those pre-pack Ginkgo Nuts which can get from most supermarket in the vegetable chiller section. Recently due to my busy working schedule and cloudy weather which is often rains in the early morning, Reyon and I have not being to our favourite Picnic for quiet sometime and that actually upset our little friend. He really missed the beach, the water and especially the shell picking......... So today, early in the morning, since the weather is pretty good..... we quickly get ready our Picnic Snack Bento and set off for the picnic(you can read more Here). 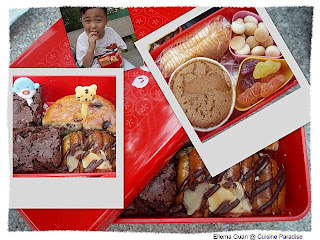 In this snack lunchbox, I include the some ready-bought pastries which I cut it into bite-size then for the bottom layout Reyon add in all his favourite snack items and tata...... we have our snack bento box ready in no time. 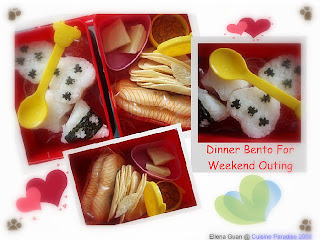 On Sunday afternoon, before we went out for a short shopping trip with Grandma, I also prepared a mini Dinner Bento upon Reyon's request. He wanted to have some assorted Mini Onigiri on the top layer then in the bottom layer, I gave him some extra Fish floss to go with the Onigiri, Chocolate and Crackers for Dessert. He loves this way of presenting his dinner and to our surprised he finished everything up within less than 15 minutes. Tata.... My 1st dessert upon the re-opening of Cuisine Paradise Foodblogs after the restructure of blog layouts. Have you ever tried the combination of chocolate and banana before. I guess most of you have tried Banana Chocolate Cake in most of the bakery shop before and the taste it perfectly well match right? 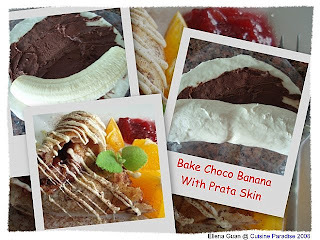 This afternoon I made this Bake Choco Banana with Prata Skin for our tea-break. 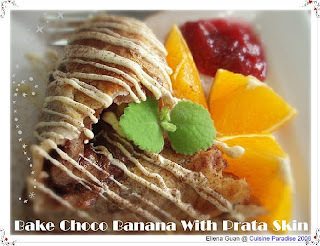 I spread a thin layer of Nutella on a piece of frozen Prata Skin and wrapped it up with banana. After baking into golden parcel, I served it with some orange wedges and drizzle the banana parcel with some white chocolate and dust with chocolate powder. You can also served it with an extra scoop of ice-cream for a more sinful treats. 1. Spread a thin layer of Nutella onto a Frozen Prata Skin and place the banana on one end of the skin and roll it up like a sausage roll. 2. You can tuck in both sides of the pastry so that the chocolate will not leak out during baking. 3. You can baked in a pre-heat, 180 degree oven for about 10 minutes, turning about 5 minutes to bake it evenly and let it have a nice and even golden brown. 4. For my case, I baked it in a oven toast so it took a longer time to get the whole parcel evenly brown which is about 15 minutes. 5. When the parcel is slightly cool, arrange it on the place, drizzle it with melted white chocolate and serve with some extra orange wedges and strawberry jam. a) You can get any brand of frozen Prata Skin from any leading supermarket in Singapore. b) If you don't prefer Orange wedges, you can serve it with any fruit of your choice. c) If you wan it to cook in a faster way, you can cut the banana into slices and arrange on one side of the prata skin then fold the skin into half like a semi-circle and bake.